#21When I first got the news that the Spaceship Earth “Epcot” signage and wand were to be removed, I wasn’t happy. I had never seen the ball without them, so to me, this was shocking. But not for long. Since I had never seen it before the wand and other needless glitz, I was horrified at the thought of all that leaving. To me, it was a part of Spaceship Earth, and without it, things would be plain and boring. Boy, I’m so glad I was wrong! When I saw that enormous “golf ball” for the first time after the decluttering, I was amazed. Saying it looked great would be a horrible understatement. 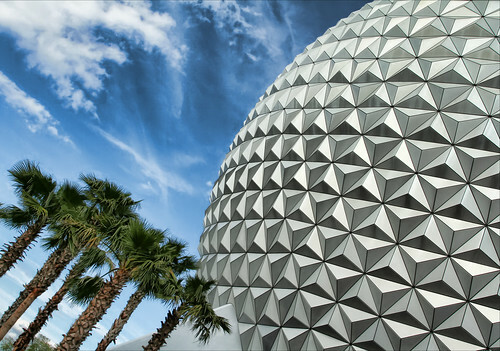 If I had to describe the clean Spaceship Earth in adjectives, it would be only the following – simple yet majestic. That’s why it’s the iconic structure for such a brilliant park as Epcot. Inside it’s reflective silver shingles an adventure awaits. I am the opposite. I was so happy and relieved to see the “clutter” leave Spaceship Earth, as I was used to the simple, clean, iconic symbol of Epcot standing alone. It needs nothing else!! Very true! The simple but beautiful icon needs nothing to make it look impressive. It’s amazing all by itself. I also agree that a “wand-less” Spaceship Earth is much better. It was nice for the year 2000 and all that millenium celebration stuff. Only. For now, this unique masterpiece looks splendorous by itself. Very true John. I enjoyed it for the 2000 celebration but it quickly got old. I never realized how wonderful it was just standing by itself until I actually saw it! My traveling partner had never seen Spaceship Earth without the wand (his first trip 2003), he was very upset when he found out that the wand was coming down. I got him a Mickey Premium, he got over the whole wand issue . . . I like it uncluttered as well, the wand could be cool in closer pictures but long distance photos are much better without it. My Dad use2 work for Disney and he use2 clean the “epcot ball” !! #20In the wonderful world of wait times, some folks often wonder how Disney manages to constantly keep an accurate wait time up for guests. And that’s where the infamous red card comes in. If you’ve ever been the “chosen one” to hold the Red Card, then you know exactly what I’m talking about. 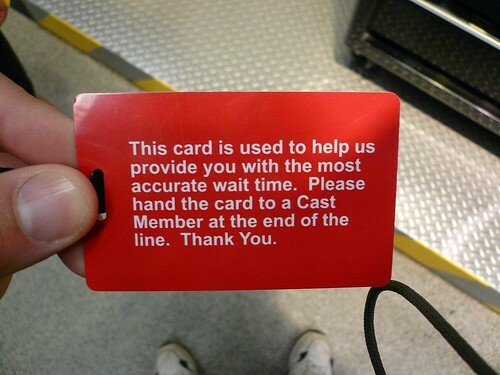 Every so often, a cast member will scan the magnetic card and give it to one lucky guest. Then when said guest gets to the end of the line, another cast member scans the card, which updates the ride’s wait time. The fate of the ride wait time is in your hands. Now doesn’t that feel awesome? I have been handed many a red card – I wonder if I look responsible or something. I always feel like I am contributing a wee bit to the magic. love it! On one of our trips it became a joke because we were asked to hold the red card so many times. We started to get disappointed when we weren’t asked to hold it! I love being asked to hold the card! Got one, thought I was allowed to skip the line. Oops. Too bad they don’t give you a fast pass card. We’ve been given one on more than one occasion at Busch Gardens! When I’m in the parks, I always see a family having a bad time. Here are the five stupidest ways families force themselves into a miserable vacation. You know what? I think we should take little Suzie on the Haunted Mansion! That’s genius – and as the parents are dragging her through the door, she could be kicking, screaming, and crying for another reason. She probably just has to go to the bathroom, she’ll be fine. I’m not really sure what are going through parents’ minds as they drag their terrified son or daughter on a potentially scary ride. Maybe they think it’ll cure their fears if they go on it at a young age. Maybe they just want to ride it and don’t care. Maybe they haven’t heard of the Baby Swap. Sure it can be hard to decide what to do, but at least make a decision. I mean there’s only so many hours in a day, and you shouldn’t spend all of them choosing what to do. Just pick something and do it. Then you’ll actually get things accomplished. The next idea people get is to run themselves ragged. They want to cram all these things into one vacation, they want to cram having fun into a certain time frame – which doesn’t work. It’s important to take breaks. Breaks are what keep you happy in the heat and crowds. Without breaks it won’t take long for your whole party to feel exhausted and miserable. Sit on a bench, go inside a gift shop, get some ice cream, whatever – it will help! Depending how often you visit the World and how long you stay, chances are you’re not going to get to do everything you want each trip. And you know what? That’s okay! Do as much as you can (while still keeping your sanity), and whatever doesn’t get done you can do next trip. Don’t burn yourself out over something that minuscule. Just do what you can and enjoy every second of it. “Aw man! It’s raining! This means everything is going to close. We might as well go back to the hotel now. This is awful.” No, it’s not at all bad – it’s actually a very good thing. Quick rain showers do a few things: they clear the parks, they cool you down, and they force you to get out of the heat and enjoy a few indoor (but no less fun) attractions. These are the top 5 things I see folks doing in the Parks that make them miserable. What about you? Do you do these things? 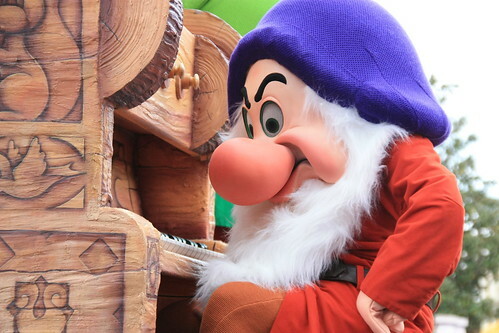 Do you like Grumpy? Share with me. OVERPACKING – I see people with a rolling suitcase in the parks, practically. What in the world are you thinking??? It really is okay to leave your luggage in your RESORT! It’s a little different if you have a baby, but if not, there’s no reason you need all that junk to be carted around all day. Put what you think you “may need later” in a locker at the front of the park, and enjoy your day unincumbered. Then if you really need that deck of cards, shoe horn and set of speakers, you’ll only need walk a little to get to them, but you’ve saved yourself traction on your back later. Haha hey DeAnna those are both very good tips! I love the overpacking one – it’s so much trouble than it’s worth. At most you should bring a little backpack type thing, but usually I only bring a camera and that’s it. The parks are so much nicer when you aren’t falling over due to the amount of stuff you bring. I’ve already been disappointed for not riding everything. But I was with a Brazilian friend and that was his first time in WDW. We see some nasty situations sometimes, huh!? One thing is to eat too much during lunch. Come on, there are lots of Mc Donalds in Orlando, you can eat 5 double cheeseburgers there. Don’t do it in a place where you WILL have to walk under the sun, wait in line and go to rides that will make all that food seem alive in your stomach. Then we see one sick family member, ruining the day of all others. Eating well is also a key element for having a good day at WDW. BTW Matt, here’s a suggestion: what about a post about the parks restaurants? Something like what is best and what is not worth going? Yep that would help the disagreements go away, and it’ll definitely let you get more done. What always cracks me up is waiting for the bus to a theme park at the resort, there is always one family that has thoughtfully loaded up little Johnnies stroller with 80 pounds of crap for the day and then the mom (usually mom?? why??) gets all indignant and aggressive with the bus driver when he tells them she has to empty and fold the stroller to get on the bus. While the rest of us patiently wait in the morning heat to just get on the darn bus to go have fun. Another thing that always worries me is seeing a baby in a stroller in the heat and humidity with no shade, looking red and hot. How scary it must be to be the victim of that kind of parenting, cover the stroller, heat stroke is so dangerous. I am with DeAnna when I see women in high heels! Makes me laugh every time. Right along with women who wear a face layered with make-up, bet that feels great about 2 p.m.! Yep heat stroke is very dangerous. I’ve seen people come close to it in WDW and it’s serious stuff…especially for babies. I think that’s the time when indoor rides are a necessity! I’m hearing ya on the caked-on make-up, Gaylin, and let’s not forget the chicks who took the time to roll their hair. It’s obviously their first time to meet “suhthin’ humidity”! Matt, thanks for the info on Gravatar, now let’s see if I did this right as well! I love this blog entry! Made me laugh LOL. True, one should never get disappointed when they don’t get to try out everything. There’s always another time, another chance to do the rest. Glad it made you laugh – and yep you’re point is very true! Another time, another chance. Oh yeah, I’ve seen that family. If the get into the park late and stick it out till the fireworks. Thier kids are hot and tired and the parents have lost of semblance of patience. It sad to see them slaughtering the disney experience. And offered him a single rose in return for shelter from the bitter cold. And as punishment, she transformed him into a hideous Beast, and placed a powerful spell on the castle, and all who lived there. Ashamed of his monstrous form, the Beast concealed himself inside his castle, with a magic mirror as his only window to the outside world. The rose she had offered was truly an enchanted rose, which would bloom until his 21st year. By the time the last petal fell, then the spell would be broken. As the years passed, he fell into despair, and lost all hope.